My hand-drawn family tree for Hild is now neatly printed and legible. I’m hoping readers of this blog will give me some feedback. As you can see, there are several names missing. For example those Æthelfrithings who died before they amounted to much, historically speaking: Osbald, Osric, etc. There are also wholly fictitious characters, and some invented names for people who know must have existed. For example Osfrith’s wife. We know he had a son. I thought a high-status Frank would suit nicely. And what’s higher at the time than the Frankish king? Clotrude sounded like a reasonable name for the sister of Clothar II. There’s plenty of time to change this before publication, though, so if anyone out there has a better idea, please make a suggestion. Or at least tell me why this won’t work. Or, even better, point me to Osfrith’s real wife, whose name I somehow missed. You’ll see, too, that I invented the name of the daughter of Hereswith and Æthelric: Ælfwyn. I hope that sounds acceptable. If it raises red flags, do please let me know. I have lots of leeway at the moment, but as the book gets closer to publication, change will grow more difficult. I couldn’t find a name anywhere for the niece of Beli of Alt Clut, and I didn’t feel competent to even guess at something suitable. If anyone has any notions about that, I’m all ears. Ditto the Pictish wife of Eanfrith Æthelfrithing. You’ll see that I chose to make Eanfrith’s mother, Æthelfrith’s first wife, Bebba (of Bebbanburg fame). Given the Brittonic sound, I rather arbitrarily plumped for Alt Clut antecedents. If any of that in any way clashes with what’s known to be known, sing out. I also posit a fruitful liaison between Hereric and ‘Onnen, some leftwise cousin of Ceredig, king of Elmet’. Their son is Cian. He’s one of the major characters in the novel, so if, historically speaking, this is ridiculous, please speak now. My major choice was to make Æthelric, the king of Deira before Æthelfrith swept in from Bernicia, Edwin’s much older brother. This means that when the Iffings fled Northumbria and scattered, Hereric, Hild’s father, was the heir-in-exile. I expect some disagreement over that one, but at this point I’m reluctant to change it. Though I’ll definitely listen to well-reasoned argument. Hereric’s wife is Breguswith. We know as much from Bede. I pondered making her East Anglian, but for reasons I forget, I couldn’t quite make that work. Instead, she’s now Æthelbert’s daughter–Eadbald’s half sister. I’d love to hear your thoughts, on any and all this. For some reason I've always thought of Osfrith's wife as being from East Anglia, a daughter or grand daughter of Raedwald of East Anglia, maybe a daughter of Raeganwald (the son of Raedwald killed in the ambush of Æthelfrith). Oswald has a British wife????? Cian sounds to me like Cain as in Cain and Able. Hefenfelth, re Oswald's wife: I can't find my notes (hard drive failure last year + office reorg = hopeless disorganisation), but a quick web search brings up The Britons, by Christopher Allen Snyder, which mentions the possibility of Beli's niece marrying Oswald. Oddly, though, I don't remember reading that book, so I'm guessing I got it somewhere else. As neither character makes an appearance in the novel (Oswald certainly will, in book 2…) I'm not, ah, married to the idea. It's easy enough to fix if it strikes you as improbable. But given the way I've sketched politics in the book, Oswald and the other Æthelfrithings would be working assiduously to build their network/power base in northern Britain to balance out Edwin's power, so it fits. As for Osfrith's marriage, didn't Yffi (his son) end up going to Frankia with Edwin's son, Wuscfrea, after Edwin's death? That plus my notion that Edwin would have been trying to balance out Sigibert's (E. Anglia) allegiance to Dagoberht with his own kinship alliances, adds up–especially when one factors in the possibility of Edwin trying to build a trade network. Eh, but the trade thing is a whole other post. Oswy had a British wife, Rhienmelth, supposedly from Rheged; I own the Snyder book, and he mentions that at the same time (as well as misspelling Alex Woolf's name in two different ways while referencing him. The Woolf reference appears to be Snyder's source, though. I used to know that article backwards but can't remember this part, I can look it up if it will help. Domelch (wife of Áedán mac Gabráin). Jonathan, excellent, Eanfrith's wife's name will begin with D. Thank you. I started the novel thinking Eanfrith and Oswald were full brothers, but the deeper I got, the less that made sense. Their decisions are so very different; it seemed easier to explain them using different fathers. I really need to read Alex Woolf. Do you have a recommendation for a starting point? No problem with making Bebba a Briton. It's been suggested before so it already has a bit of scholarly mileage to back it up. Cian is a good choice of name, as long as people don't pronounce it like the colour. Father of a Gododdin warrior: 'the young son of Cian from Maen Gwyngwn'. To me it looks right as an Elmetian name too. A suggestion for the niece of Beli of Alt Clut: Angharad. This appears in the Welsh triads as the name of a princess of Alt Clut (daughter of Rhydderch Hael), c.600. If Angharad existed she would be a contemporary of Morfudd, princess of Rheged, an equally obscure lass but another possible name with North British connections. Oswald marrying a Briton. Like Michelle I tend to lift an eyebrow at this but it's a runner because we can't say it definitely didn't happen. A marriage alliance with Alt Clut would actually make a lot of sense. Tim, I pronounce 'Cian' something like KEE-un. I like 'Angharad'. Just one problem: later in the book I use 'Angeth' (I admit, I just made the name up–I'd be very, very happy for someone to come up with something better) for a woman of Gwynedd. Hmmn. Maybe I could use Morfudd. But then, oof, people who actually know something about the period might get confused. I am open to suggestions! I'm now intensely curious as to why the notion of Oswald forming a marriage alliance with Alt Clut is so eyebrow-raising. This would be when he was young; Edwin firmly established in Deira and Bernicia/Northumbria; Eanfrith making his way with the Picts. What else might Oswald have done to shore up his position? (Real question; I don't feel defensive.) Might he have married someone from Dal Riata? But why would Eochaid Buide (whose star seemed to be firmly established at this point) have consented to that? What good would an essentially homeless Oswald have been to him? I think I always figured Oswald marrying an Irishwoman via Iona connections. That's not as odd as it might sound, because one way to read the Scots king-lists and Annals of Ulster together is to see Eochaid (whom the Annals call King of Picts at his death) as having to contest his father's kingdom with Connad Cerr mac Conáill, head of Cenél Comgáill (one of the leading kindreds of Dál Riata, whom the Annals of Ulster and the Annals of Tigernach both call King of Dál Riata before Eochaid's death. Conall seems to have been mostly busy in Ireland but if his kingdom was contested, a future Bernician ally might just have seemed a good idea. In support of that is the fact that when he died fighting in Ireland there died with him one Osric, named in the Annals, whom John Bannerman thought was Oslac son of Æthelfrith. I don't buy that necessarily but at least it shows a presumably noble Anglian in his following. Bannerman saw Conall as son of Eochaid, which is how the Senchús fer nAlbán has it, and these days I would be much inclined to agree, but apparently I preferred the opposite argument (based on the king-lists, which are probably later and less well-informed but also less political) when I wrote my Master's thesis, from whose prosopographical index I am hauling, uncomprehending, all these data. I also think Bannerman's argument fits better with what I now think, because that might help explain why Ferchar, Conall's son, appears to wind up contesting Atholl with Pictish kings later. But since there's no way to prove either case you could have it whichever way you'd rather! I think I would have enjoyed being one of Woolf's graduate students in an alternate universe… It is, indeed, a drool-worthy list. As you point out, this is one of the joys of the period. Such freedom! Well, not to name-drop much but I had dinner with Alex last night, after he was presenting a paper here, and I understand that he is now working on a new monograph that will collect a lot of his thoughts about the early period, large parts of which he is trialling as papers this winter. 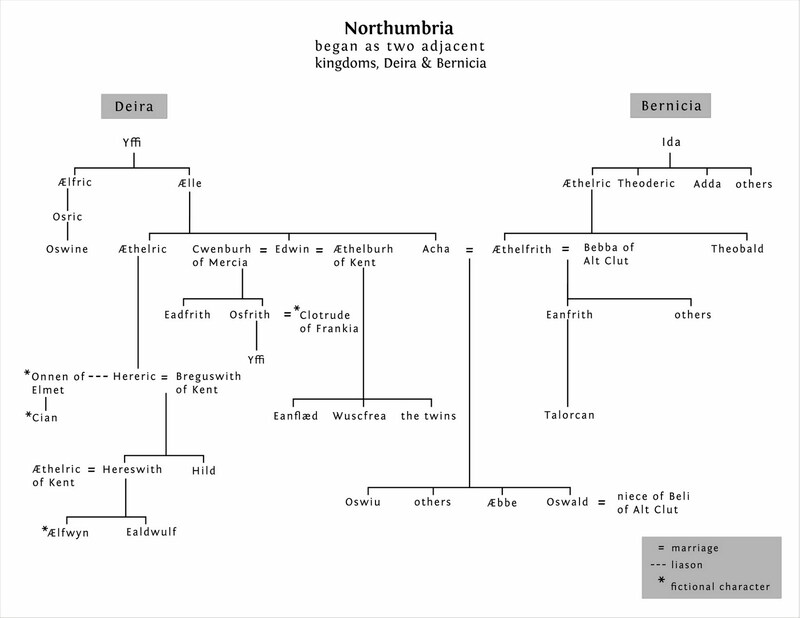 It may not have as much family tree detail as you might need—though there James Fraser's From Caledonia to Pictland might already help, I find it difficult but thought-provoking—but from the sound of what Alex was saying last night his book may be a genuine shift in the way we see the early medieval North and its changes. So, watch that space! I tend to think of the Britons as being enemies of the Aethelfrithings and possibly allies of Edwin with the express idea of keeping the Aethelfrithings from returning. The talked about some of this in my old Heroic Age article “the Politics of Exile”. Gee..that article is old now. The marriage of Oswiu to Rheinmellt is usually seen as happening in the wake of Cadwallon's defeat. You might also want to read Martin Grimmer's article in the Heroic Age on Oswiu's marriages. As for Oswald marrying among the Irish, I think that is most likely. Part of a the politics of taking in a young exile is for them to become part of the king's family in some way by marriage. Edwin marries a daughter of his Mercian's host. Marrying into the host's family also gave the exile some additional status and a place in the host's kingdom if they never return home. Having a high status warrior who owes his loyalty completely to his host is a boon to the host. An English retinue fighting for the Irish in Ireland is probably part of deal for their refuge. I know Oswiu married–or had a fruitful liaison with–an Irish woman. But for some reason that made me think Oswald might not have. There's something about those brothers I can't quite put my finger on. I go back and forth about them being either half brothers or full brothers with some bad blood between them. It might not have been either–or it could have been both–but they seem very differently oriented and motivated. I've read your Heroic Age articles down their consituent atoms 🙂 But it's been a while. I'll enjoy reading them again. I'm guessing I've also read Grimmer's–but I reread that, that. I go back and forth about them being either half brothers or full brothers with some bad blood between them. It might not have been either–or it could have been both–but they seem very differently oriented and motivated. Well, yes: where is Oswy during Oswald's reign? Am I missing something or is it 'still in exile'? Would we necessarily expect any different, perhaps not, but I can see where your impression comes from. Somewhere in the back of my mind I'm already building these characters (neither makes an appearance in Hild, but they will in Book 2). Oswald is a responsible sort of fellow. Oswiu is a typical youngest son: spoilt and a little whiny and weasely and full of improbable Bright Ideas. (One of those people who thinks that a king gets to do whatever he wants, that one's subjects should just do as they're told without question.) Oswald likes to keep him out from underfoot. Have you contacted Heather Rose Jones http://heatherrosejones.com/ about British names and history? That is her area of expertese. I posted info about her months ago, but you may have forgotten. Morgana, I had forgotten. Thanks for the reminder. I think Oswald and Oswiu have to be half brothers. Æbbe was the uterine sister of Oswiu. If they were all the children of Acha (Oswald's mother) there would be no need to claim she was the uterine sister. It is also quite possible that Oswald's son was no friend of Oswiu, possibly raised in opposition or perhaps in an uneasy acceptance by Oswiu to prevent war. Oethelwald being someone the Deirans and Oswiu would accept. Oswald and Oethelwald would be cousins of Hild, but not Oswiu. This would also mean that Oswiu and Eanflaed were not related. You know Hild and Oswald would be cousins. Hild is the granddaughter of Edwin's older brother and Oswald is the son of Edwin's sister. Oethelwald and Hild would be in the same generation in relation to their mutual uncle Edwin. I rather suspect that Oethelwald is one of the kings of Deira buried at Whitby. Michelle, I hear you on Oswiu and Oswald being half brothers. It makes sense (esp. given the 'uterine' sister info). I'll figure out how to work that in. I admit that I haven't given a moment's thought so far to Œthelwald. The age vs. generation thing muddles my thinking sometimes. I'm assuming right now that Œthelwald would be a good bit younger than Hild. As I ponder Book Two I'll have to clarify all this. Mutter mutter. Your help continues to be invaluable. Thank you.